Mr. Shrinkwrap is a leading distributor of shrink film and shrink wrap supplies & installation accessories. With over 25 years in the business, we can provide expert installation advice & offer quality shrink wrap supplies. We ship a variety of products daily from our main warehouse in suburban Philadelphia, PA as well as the ability to ship directly from many of the manufacturers that we we represent. Our distribution network allows us to reach most US cities in 3 days or less by ground. We offer discounted pricing for business customers please contact us for business pricing. We are expanding our distribution network worldwide, for distribution opportunities, send us an email. Mr. Shrinkwrap also specializes in providing on-site shrink wrap services in a variety of commercial, industrial, residential and agricultural applications. 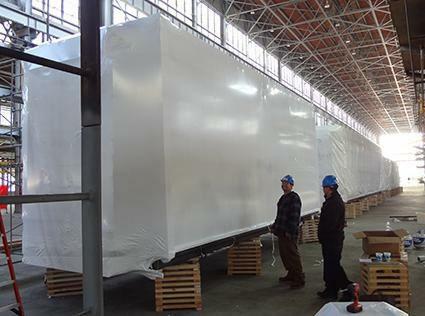 We have extensive experience with all packaging and construction application of shrink wrapping; in terms of size, we have wrapped entire buildings to small pallet sized items for shipping. The benefits of shrinkwrap often translate into a more cost effective packaging or storage option for many businesses. Mr. Shrinkwrap has consulted with and trained the staff of many companies who have incorporated shrink wrap into their process, contact us today to find out if shrink wrap can benefit your company.